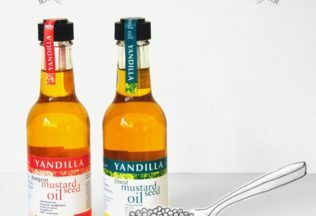 The Yandilla Mustard Seed Oil won a bronze medal at the 2017 Sofi Awards run by the US Specialty Food Association. The awards have been running for 45 years and honour specialty food innovation. Yandilla’s mustard seed oil won a bronze medal in the nut and other oil category. Over 62 culinary experts blind tasted the oil against other competition entries. Farmer and producer of the oil, Viv Weatherall, said the medal “came as a bit of a surprise”. Yandilla mustard seed oil is sold in the US through a distribution company. It is typically used in Indian cooking and is becoming popular among chefs due to its high smoke point and wasabi-like heat. The Weatherall family established Yandilla Mustard approximately 30 years ago in Wallendbeen in southern NSW. Today the family grows approximately 200-300 tones of mustard seed each year. The business was a financial recipient of the Australian Federal Government’s Farming Together initiative. Yandilla received $200, 000 to develop an oil processing facility from the program.